The famous watch brand Grieb & Benzinger announced the release of a new model of Black Tulip Sabudha Imperial, marking the third anniversary of the only English-language Simply Abu Dhabi in the United Arab Emirates. The beginning of friendship between us served our mutual support and collaboration during the creation of the first issue. On the occasion of the third anniversary, it was decided to launch a new timepiece presented in a single copy. 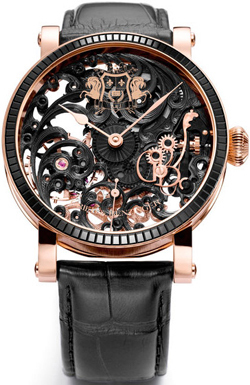 The result was presented skillfully made watch Black Tulip Sabudha Imperial, inlaid with the most mystical stone – black spinel. Watches are the epitome of the philosophy of the company Grieb & Benzinger – single masterpiece, created by ancient technology and tools XIX century. In skillfully interwoven to create a design model of European mythology and culture of the Middle East. Look of the model resembles the great mosque of Sheikh Zayed in Abu Dhabi, and all the luxuries of a large sparkling body made of pink gold bezel complements the black spinel. This gem was not chosen by chance, given the fact that at present it is one of the few in the world. Stone perfectly matched and polished attractive depth and intensity of color, and amazingly smooth, clean surface. By the way, one of the gems adorning the crown is now the UK – Ruby “Black Prince” – is actually a spinel droplet form, not ruby.